I n general, driving into Mexico is considerably easier than it was just a few years ago, and getting from the U.S. to San Miguel de Allende by car is not difficult—it's just long. It's a big country. Going through the mountains driving into Mexico. Driving in Mexico is a far more pleasant experience than it used to be. In the last 20 years or so, the Mexican government has made a massive investment in new Mexican toll roads. These cuotas are excellent and their number and variety grows every year. When you drive to San Miguel de Allende, you'll be on a four-lane divided highway almost all the way. Traffic is never a problem on the cuotas. If you're used to driving the U.S. Interstates, you'll be impressed and pleased. They're well designed, well maintained, and clearly signed (in Spanish). They're even patrolled by a special police force, the "Green Angels," whose only job is to help you if you break down, run out of gas or get a flat tire. For free. Toll booths are spaced out, near towns and major turn-offs. The toll plazas usually have a place to park and stretch your legs, clean restrooms and vending machines. Many also have convenience stores, frequently one of the OXXO chain, like a 7-11 or Circle K.
Driving Into Mexico: Cuota or Libre? When driving into Mexico, you don't have to travel on the cuotas, but you'll probably want to. By law, all toll roads in Mexico must have a generally equivalent alternative free road, a libre. 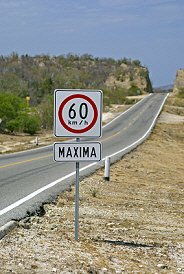 So in Mexico, highways can be free or toll. The free ones are longer, curvier, more heavily trafficked, and not as well maintained, but they are available. And a large percentage of Mexican drivers use them. Leaving the cuotas for you. A good map and route guide is an excellent investment. The finest by far is the Guia Roji, the gold standard in Mexico maps. When driving into Mexico and negotiating Mexican highways, the Guia Roji is a definite "don't leave home without it." How much you pay in tolls depends on your route. If you drive to San Miguel de Allende Mexico through McAllen/Harlingen/Los Indios in eastern Texas, you can get away with less than five bucks. If you take the toll roads from Laredo, TX (the most common route) expect to pay $40-50 in tolls (depending on dollar/peso exchange rates). Both the libre and the cuota versions of the same road often have the same number. Watch carefully for signs for the cuota turn off. Whenever you're driving into Mexico, make sure you have pesos with you to pay the tolls. Though some toll booths are beginning to accept credit and debit cards, you can't count on it, and U.S. dollars are not accepted. Insider's Tip: Keep your toll receipts. You might be asked for proof of payment in case of an accident. Whatever Mexican border crossing you choose, the process will be similar. You'll go through customs, then get your immigration form and your car permit. Don't skip any of the steps. Important Note: If you're a U.S. citizen, be sure you have your passport with you. After June 1st, 2009, you will not be allowed to enter Mexico or re-enter the U.S. with just a birth certificate and photo ID. You must have a passport. If you need to get your passport quickly, you can use a passport expediter to speed up the process. Here's a complete guide to the Mexican border crossings you may encounter when you're driving into Mexico and on to San Miguel de Allende. Whichever Mexican border crossing you choose, you'll have to stop and get a Mexico car permit for your car. This is vital. Mexico is serious about trying to stop the tide of illegal American cars flooding Mexican highways. If you're caught driving through Mexico in a U.S. plated car without the Temporary Vehicle Import Permit window sticker you get at the border, your car can be confiscated. Don't take that chance. The process of getting your Mexico auto permit isn't really complicated, it's just very precise. Read exactly how to get a Mexico car permit so you'll avoid any possible headaches from driving in Mexico and get on the road again. There are many ways to drive into Mexico and on to San Miguel de Allende, but most travelers stick to one of three main routes, crossing the border in Texas. Which one you choose depends on what part of the U.S. you're coming from. With the recent border violence, the crossing from El Paso to Ciudad Juárez is not recommended. For driving to San Miguel, this page will give you driving directions, Mexico , for each of the main routes. However you drive to Mexico, once you get to San Miguel de Allende, my best advice is to park the car and leave it parked most of the time. 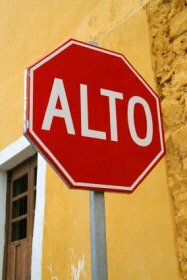 Traffic in San Miguel these days is hellish, especially in the centro and on the two salidas leading out of town. And parking in the centro has become an impossible dream. Trying to find that elusive parking spot a block from the Jardín is guaranteed to get your day off to a very bad start. And that's definitely not why you're in San Miguel de Allende. Walking is the best way of getting around San Miguel. Once you are accustomed to the mile-high altitude and have grown used to walking on cobblestones, you'll love the chance to see SMA at this slower basic level. And it's free! Just be prepared to spend way longer running errands than you expected because when you're walking in San Miguel, you tend to run into so many friends and have so many "corner conversations," or coffee chats that sometimes, as my friend Sam says, "It takes all day to do nuthin'." If you can't walk to where you're going, the city buses go everywhere and are dirt cheap. Taxis are plentiful and inexpensive. You can almost always hail one from any street corner. Unless you're headed out for a day at the hot springs or a run up to the La Luciernaga mall or maybe a to-die-for-dinner out at Ristorante Da Andrea at Rancho Los Labradores, plan to leave the car in the garage. Take it out to make day trips to Dolores Hidalgo or Guanajuato or a Wal-Mart/Costco run to Querétaro or Celaya. If you want to get to San Miguel by car, don't be put off by the fearmongers and doomsayers. 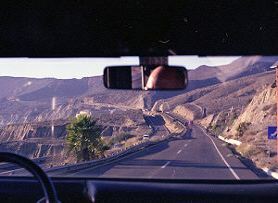 Driving into Mexico can be a pleasant experience and a great cost saving over flying. And you'll be glad you have the car on those rare occasions you want to get out of San Miguel de Allende.